A dental veneer is an aesthetic restoration that we bond to the front of teeth that are visible when you grin or laugh. For most people, this is the 6-10 upper front teeth. Each thin shell of porcelain is crafted in a way that — when paired with other veneers — changes the overall colour, size and shape of your smile. 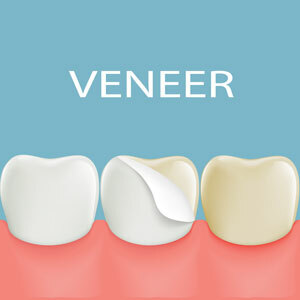 Choosing to have dental veneers usually requires at least one planning appointment and two treatment visits. During your initial consultation, we’ll discuss things such as what you want to change about your teeth and how you want your new smile to look. Next, you’ll come in for a preparation appointment. After we’ve made minor adjustments to your teeth (so that bonding a veneer over them does not add “bulk” to your smile) we will send an impression and specifications for your veneers to our dental lab. About two weeks later, your customised veneers are ready to permanently bond into place. As soon as you look in the mirror, you’ll see what looks like an entirely new smile. Before placing veneers, we’ll need to make sure that your teeth are healthy. Any underlying gum disease or decay will need to be addressed, to ensure a stable foundation for your veneers or any other type of cosmetic treatment. Book a consultation today to learn more about our personalised cosmetic dental options like veneers, whitening and braces.